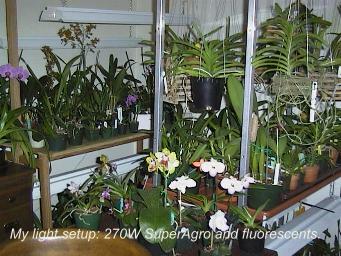 Here are some photos of our area and the Orchids that we grow. 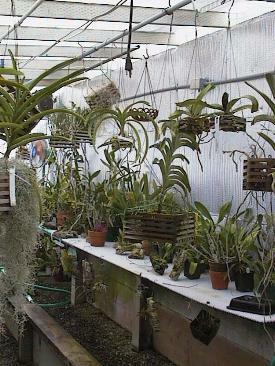 Contra Costa county is a challenging climate for growing orchids. We get a lot of sunny days, but with it comes hot, dry summers. Luckily, our winters are relatively mild, rarely with freezing temperatures. About half of our members own their own greenhouses. Although its not strictly mandatory, it does make watering and misting much easier! 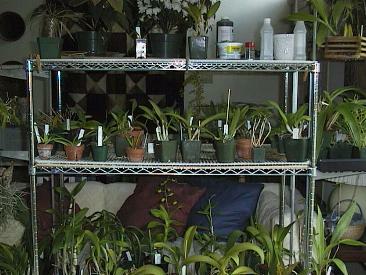 This is an interior view of Barbara's greenhouse. The rest of our members grow on window sills or under lights. This is one of the more elaborate light set ups. Most members are more sane, and grow on windowsills. Juan took a baker's cart and covered the shelves with egg crate and plastic. This holds just enough water for humidity. 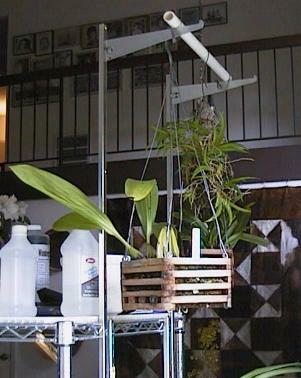 Then he took regular wall/closet hangers and mounted them on the side of the cart for his hanging plants. It easily moves on it's large wheels to get the best sun.